We are ecstatic that our album we have been working on during the past year has now been finished and pressed! (see genuine hand with genuine CD above). 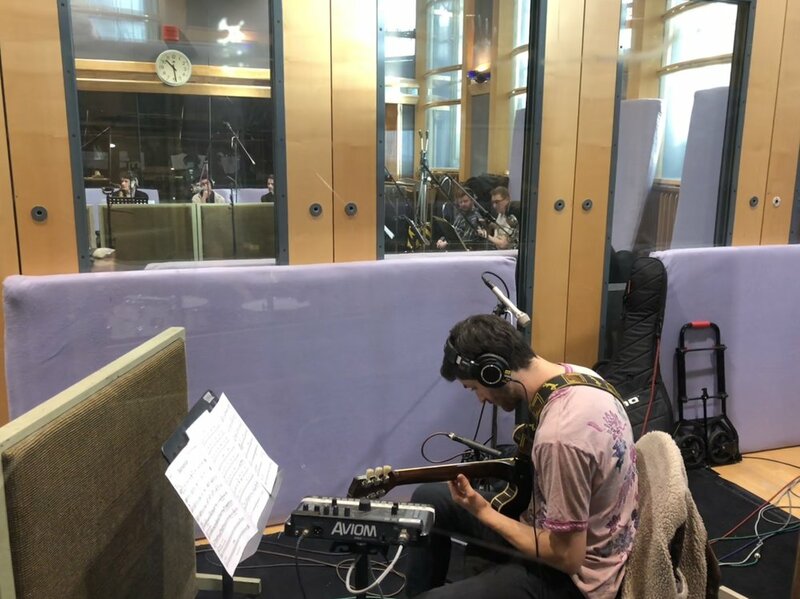 We recorded the 8 tracks at AIR Studios back in December 2017 and have been mixing and editing it throughout 2018, along with all of the other stuff that frankly is too boring to talk about here. But the main thing is - IT’S DONE! And it sounds absolutely sublime. We’re so happy with how it’s turned out both sonically and aesthetically (big shout out to Katia Mullova for the incredible and unique artwork) and we can’t wait to share it with you all so you can hear it too. We have a tour lined up to launch the album with dates in Watford (Feb 24th), Cambridge (Feb 26th), Sheffield (Feb 27th), Leeds (Feb 28th), London (Mar 1st) and Oxford (Mar 20th) so if you if you’re nearby and free we would love to see you there! Head to the LIVE DATES page for more info and booking tickets. In the meantime, you can actually pre-order albums here to be among the first people of the general public to hear it. It features 8 original compositions written by our pianist Liam Dunachie, drummer Scott Chapman, trombonists Tom Green and Kieran McLeod, trumpeter James Davison, bassist Misha Mullov-Abbado and saxophonist Matthew Herd. Each composition has a reference in the cover artwork - we’ll let you figure that out once you’ve got your hands on a copy! It's been a great summer! And we're not just talking about the scorching weather. Firstly, our third time back at the beautiful La Mortella on the island of Ischia, Italy. A knockout few days once again playing in such an amazing setting, eating delicious fresh Italian food, and enjoying some sunny island life. Hopefully it won't be long before we're back once again. Secondly, thanks to everyone who came and saw our set at Wilderness Festival in August (above), what a brilliant crowd! We had a really fantastic time and it was a pleasure to be part of the festival. Next up for us is the London Jazz Festival in November. Always great to be included in the programme for this, and one that's close to our hearts as we played our first ever gig at the LJF back in 2014! As ever, there's so much going on in the programme but if you're free Nov 21st then we'll be at the Vortex jazz club in Dalston so grab a ticket now (here's a link). In other news our album is coming along very nicely indeed. A few of us went for a mixing session the other day back at Air Studios where we recorded, and it's sounding ace! Just a few more tweaks and it'll be there. Hopefully we'll be releasing it sometime around the beginning of 2019, with possibly a little tour to go alongside it, so as always keep your eyes and ears peeled. We can't wait to share it with you! We'll update here when necessary, but to keep up with the very very latest follow us on Facebook and Instagram and you won't miss anything. For now, here's a super sneak peak of Liam Dunachie's 'Mr Pottercakes' from our recent mixing session! ...That's right! It's official. The hard work has been done and the album is now in the slow cooker, ready for the end of the year. We had a brilliant couple of days at AIR Studios just before Christmas and recorded eight of our own compositions which will make up our debut album. Exciting stuff! Safe to say that everyone pulled it out of the bag when it came to the crunch, and it was particularly special to hear our pieces back played and recorded so well - since we're always the ones playing them in the band. Right now we're on the verge of making a start on mixing the tracks, amongst planning the album release and other logistics. We can't wait to get it out there, it's all set to be a corker! Sit tight in the meantime though and we'll give you a nudge when it's on the home straight. By the way, hope you're liking the new site. We had a bit of a freshen up for 2018. Hopefully lots more good stuff in the pipeline to happen this year. We're hugely excited to announce that we will be recording our debut album at the end of this year at the prestigious AIR Studios! We cannot wait and are thrilled to officially record our music for the first time in such a fantastic space. Our only dilemma right now is deciding what to record, as we probably have enough music for two albums right now! Either way, it's going to be great and we have plenty of time to think about that. Last night we had a great gig at Omnibus Clapham (hopefully with some photos and videos to follow) and are looking ahead to our next outing which will be on June 13th at the Dalston Eastern Curve Garden as part of the 'Woodburner' Festival, which runs every Tuesday from June to September. Details can currently be found here on Facebook. Hope to see you there! Hello again! So it's about time we updated you all with what's going on as we've got some more exciting things coming up... First of all we're looking ahead to our London Jazz Festival gig at the 606 (Sunday November 13th 1:30pm). Really thrilled to have been included in this year's programme, especially since the band launched itself with its first ever gig at 2014's festival. Blimey it only feels like yesterday! Well that's all for now, we'll see you at the 606 on November 13th - don't miss it! Welcome to our shiny new website! We have an exciting year ahead so do keep checking this page to see what we're up to. Thanks to the folks at Help Musicians UK who run the Peter Whittingham Award, we have been given £5000 funding which is really going to help take our plans for the orchestra to the next level. We're setting up our own night called 'Patchwork' which is very exciting, and plans for an album are in the pipeline too. Meanwhile, take a look round the new site and find out who we are and what we're all about. On another note we were very pleased recently to be invited to play at the 25th anniversary celebration of the Peter Whittingham award at Kings Place in London, hosted by Julian Joseph. It was a great evening with performances also from past winners of the award Soweto Kinch and Stretch Trio. Here is a photo taken from our set, in what appears to be Sam Rapley full steam ahead mid solo. Nice.